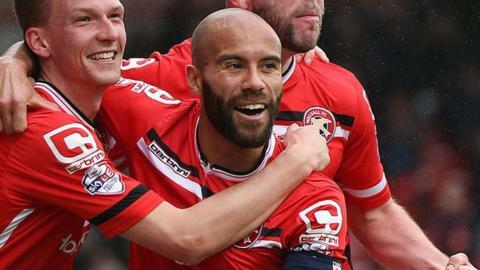 Walsall skipper Adam Chambers has signed a new deal with the promotion-chasing Saddlers, regardless of which division they will be in next season. The 35-year-old holding midfielder, who has missed only one game for the Saddlers this term, has put pen to paper on a new one-year contract, with a further year's option. "I'm happy to have it sorted," he said. "I feel I'm still contributing. "I've always said, as long as I feel I'm contributing then I'll still play." Chambers, who has made 235 competitive appearances for the Saddlers in five seasons since signing from Leyton Orient in July 2011, won the club's two Player of the Season awards on Sunday night. He received them just hours after captaining Walsall to a 5-0 victory at Port Vale, their biggest win in over five years, to narrowly miss out on automatic promotion. They now face a two-legged semi-final against Barnsley to determine who faces either Millwall or Bradford City at Wembley on Sunday 29 May. "Going into the play-offs, it means I can fully concentrate on that," he said. "I'm very happy here. There are some really good people in and around the club. "The environment that has been created over the last few years has made it a joy to work here." Walsall have confirmed that top scorer Tom Bradshaw will be available for the play-offs, no matter what his international commitments are. The 20-goal marksman has been named by Chris Coleman in Wales' 29-man squad for a pre-Euro 2016 training camp in Portugal. Coleman and his players are due to fly to the Algarve on Monday 23 May - six days before the League One play-off final at Wembley. But, if the Saddlers get past Barnsley over two legs and make it to Wembley, 23-year-old Bradshaw will not be included in the training squad. Coleman is expected to name his final 23-man squad on 31 May for Wales' first major tournament since the 1958 World Cup. Bradshaw made his international debut in March as a second-half substitute in their 1-0 defeat in Ukraine. Defender Jason Demetriou has also been called up for Cyprus for their friendly with Serbia on 25 May, but he too would be excused international duty if the Saddlers make it to Wembley.